The Editor Color Palette allows content editors to style their blocks using the theme’s color scheme. 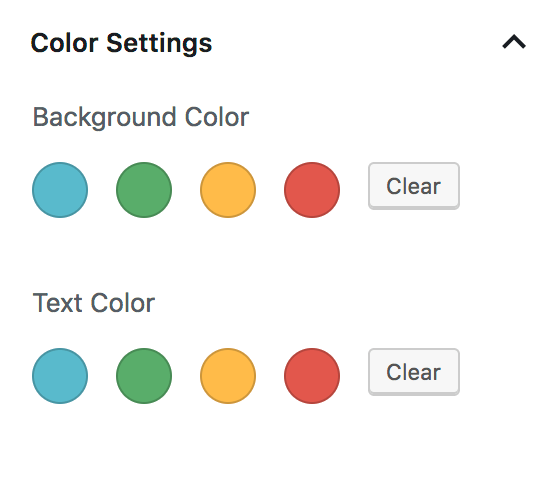 When a custom color palette is registered in your theme, WordPress will use CSS classes for styling elements rather than hardcode the color in the content. I’ll also show you how I style the button block to use the color palette. I’m using the actual color as the slug, which I think is the best approach for individual client sites. A few years from now we may build a new theme that looks totally different, but their color scheme for brand colors will remain unchanged. An alternative approach is to use generic terms for the colors like primary, secondary, and tertiary. I think this is the best approach for widely distributed themes, like premium themes by StudioPress. When a user changes themes, the actual colors will change to match that theme’s style guide, allowing a seamless transition between themes. Your Color Settings panel should now match the screenshot at the top of this article. If you select the blue color as the Background Color for a block, WordPress adds .has-background and .has-blue-background-color to the block. If you select blue as the Text Color, WordPress sets the classes to .has-text-color and .has-blue-color. You can automate this with SASS by defining an array of colors and looping over it. Styling the button block can be difficult given all the styling options available to editors. Hopefully soon we’ll be able to reduce the color options for the button block. Provide appropriate hover styling based on button background color. Provide appropriate text color styling if editor hasn’t selected one, based on background color. Remove button styles that aren’t applicable. I want all buttons to be square, and the default background to be blue (the first color in my $colors array). On hover, the background should get darker and no underline should appear on the text. If the button doesn’t have a text color selected, set the default and hover text color to white. 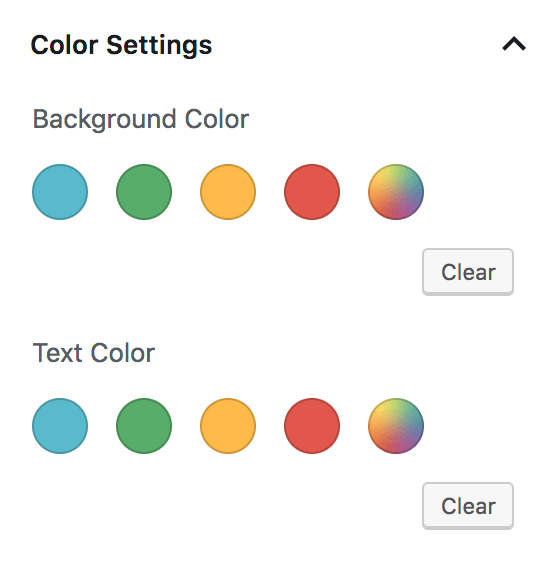 If the button doesn’t have a background color selected, use the first color listed in the $colors array shown above, and set the hover background to be 20% darker. If the button has this background color, set the hover state to 20% darker. In the SASS snippet above, we’re setting the button background color to 20% darker on hover: background-color: darken( $color, 20% ); . But often our designs call for a specific color to be used on hover. The $colors one shown above, that maps the color name to its hex value. A $color_hover array, which maps the color name to the hover color hex value. The button block includes three “Block Styles” – Rounded, Outline, and Squared. You can switch between by clicking the “Change Block Type” button in the top left corner. On most of the sites we build, we don’t want different button styles like this. The style guide calls for buttons to be square or rounded – not a mix of both. For more information see Block Styles in Gutenberg. How have you been using the color palette in your theme? Any tips or tricks on styling different blocks? Please share them in the comments below. I share my Genesis starter theme, and a non-Genesis starter theme. Every block type in the WordPress editor can have multiple style options. I’ll show you how to add and remove style options from blocks. The how to deregister the button styles that shouldn’t be used, is so super useful, and it didn’t even occur to me to try that. You just made my life so much easier. Thank you, Bill! Very nice! Putting all the colors in an array and looping through them in SASS is a cool little trick. It saves time and keeps things organized. Thanks Bill! ps. Don’t forget to address the focus state on your button-link styles for accessibility. Good point! I’ve updated the snippet above to include focus styling. Hey Bill, great article. I am wondering, is it possible to define separate pallets for background and text? The color groups are definitely different and it would be awesome this this was possible. BTW. Love the web site design. As of right now you can only specify a single color palette for use everywhere. I’ve created a GitHub issue requesting the ability to reduce the color options on a per-block-type basis but it hasn’t received any traction yet. Really enjoying your recent Gutenberg theming blogs. In my case I use Bootstrap v4 buttons happily everywhere else in my templates and my old TinyMCE custom formats. The issue I run into is that the Bootstrap buttons have a different HTML markup to core Gutenberg button block ones. So in Bootstrap you add the relevant CSS class directly to the <a> element. In Gutenberg the class determining color, size etc is added to the wrapper div, not the <a> – which throws a spanner in my SASS works. I’ve experimented with ACF Blocks (5.8 beta), Lazy Blocks, Block Library, Atomic Blocks etc. The issue with them is that they ether don’t use the Gutenberg color picker (where you can set your theme colours), or they return the colour as a HEX value, not as a ‘has-blue-background-color’ CSS class. Long story short, I don’t see an easy way of filtering the actual HTML markup of the core blocks, you can only (de)register styles associated with them? Interested in your thoughts, perhaps I’ll just sit tight in the meantime as someone cleverer than me is bound to make a Bootstrap button block sooner or later. You’re right, I don’t believe there’s a way to filter the actual HTML markup of core blocks, and that’s probably by design. A better approach would be to remove the core button block and add a new “Bootstrap Button” block with the markup you want. Quick question: How can we reflect customizer color changes in the editor? I don’t use the Customizer so I’m not sure what color changes can be made there. Aren’t those usually theme-related color changes, like header or footer background color? We build & sell themes, so the customizer has theme-related colors + some element colors (for example a button). Or it can have the theme’s primary, secondary, tertiary color palette. When someone changes colors in the customizer, these should also reflect in the editor. Is there a hook that we can use to reflect these changes? The Gutenberg color palette is defined in the theme’s functions.php file using add_theme_support( 'editor-color-palette' ). You could check the site option for the theme color and conditionally load different styles there. When a change is made in the Customizer, I assume it reloads the preview page and the new color palette would be built using the new setting. Thanks for sharing this, Bill! I was wondering if you know how to apply the color palette styling options to the headline block – seems kind of weird that you can style colors and sizes with the paragraph block but not the headline one. Unfortunately no, I don’t think it’s possible right now to add the color palette to headings. But there’s an active discussion on GitHub about adding that feature. For some reason I cannot unregister the default button styles, using wp.blocks.unregisterBlockStyle. In the same function added button style works fine, but nothing I have tried removes them. Have tried different dom functions, wrapping it in jQuery and various enqueue’s… nothing works, have they updated something to make this not work anymore? Also have looked everywhere on how to add an extra select or dropdown option that will add an extra setting to the button but came up with nothing, Would like to add something like a size dropdown, small, medium, large, etc what would put the css class on the button for size control. Can this be done now? When you view the source of the Gutenberg editor, do you see your script loading? You should use get_stylesheet_directory() in the filemtime(), but I don’t think that would affect the script loading. You have wp-dom-ready as a script dependency, but I have wp-dom. I’m guessing there’s no script called wp-dom-ready, and since that dependency doesn’t exist your script isn’t loading either. I’d also remove the wp-edit-post dependency. 1) Remove the color palettes selectively? That is, for example, with the button block to not have the background color or the text color? 2) Is there a way to assign colors selectively to a palette(s)? So, for example, background colors might all be dark, and text colors all light? Ultimately, what I’m attempting to do is to use the default blocks – there’s no sense reinventing the wheel – but altering them to create a simplified UX / editor experience that’s also brand-centric. For example, have predefined button, quote, etc styles (read: design + colors) and less “mix and match”. Also, likely replace the Advanced > Additional CSS Class with a select, again from some finite list. Any thoughts on these ideas would be greatly appreciated. p.s. Is there a native Gutenberg control for displaying 2 colors together (as opposed to only single colors). For that matter, is there a listed of native controls period. I have been anything mentioned anywhere, tho’ I would think there’s a finite set to pick from, yes? I have yet to find a way to disable the color palette for certain block types, or modify the colors available in the palette by block type.